FORT WAYNE, Ind. 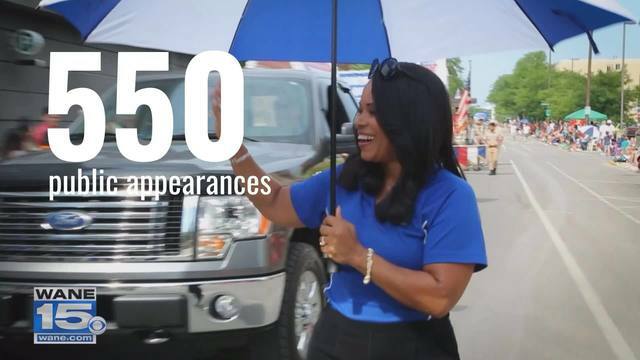 (WANE) - WANE 15 evening news anchor Terra Brantley, a veteran broadcast journalist of more than three decades and the longest-serving African American news anchor in Indiana history, has been selected for induction into the Indiana Associated Press Hall of Fame. A multiple regional Emmy Award nominee, Brantley anchors northeast Indiana and northwest Ohio's WANE 15's top-rated 5 p.m., 6 p.m. and 11 p.m. newscasts, and serves as the host and producer of a weekly sponsored franchise segment called "Positively Fort Wayne," in which she focuses on stories that inform and inspire viewers. Brantley previously hosted WANE 15's morning and noon newscasts for more than 20 years. Over a career that has spanned 33 years, including 26 at WANE 15, Brantley has won numerous Indiana Associated Press and Society of Professional Journalists awards. She is a past recipient of the Indiana Women’s Commission Torchbearer Award, the Fort Wayne Boys and Girls Clubs Brilliant Woman of the Year Award, the Purdue Parent of the Year and the Healthier Moms and Babies Inspirational Mother of the Year Award. She has also received the Indiana Black Expo Broadcast Media Award, The Society of Professional Journalists Minority Coverage Award, The Indiana Broadcasters Association Spectrum Award, The Indiana Black Expo's Liz Daily Crawford Broadcast Media Award, The YWCA of Northeast Indiana's Women of Achievement Award, The Fort Wayne Chapter of the Indiana Black Expo's Torch Bearer Award and The Fort Wayne NAACP Media Award. It is Brantley's love of community, however, that sets her apart. She has worked with March of Dimes of Northeast Indiana, Healthier Moms & Babies, The Unity Performing Arts Foundation, The Fort Wayne Urban League, The United Way, The Fort Wayne African American Cancer Alliance, the Fort Wayne Urban League Guild, Genesis Outreach, YMCA Greater Fort Wayne and the YWCA Circle of Women Committee. She regularly speaks at various community functions both charitable and civic, and serves on numerous community boards. What's more, Brantley serves as a motivational speaker, often touching on her own story of survival of domestic violence. She's a mother of two and a proud wife. "Terra Brantley is quite simply a jewel," said WANE 15 News Director Ted Linn. "We are extremely fortunate to work each day alongside a complete professional. The passion Terra brings to her role, not just at WANE, but also in the Fort Wayne community, is remarkable. She is so deserving of this honor and I am so proud." Brantley has interviewed newsmakers like then U.S. Senator Barack Obama, Academy Award winning actress Marcia Gay Harden, Civil Rights leader Jesse Jackson, Emmy Award winning actor Danny Glover and Grammy Award winning singer Roberta Flack. And she has no plans to slow down anytime soon. Brantley will be inducted into the Hall of Fame during a ceremony April 27 in Indianapolis.